This is a common question at this time of year when cicadas are nowhere to be found. As one of the local weathermen described May as cold and rainy. That is the answer. Cicadas are predicated upon heat and sunshine. If it was rainy or snowy in the case of this May, we can assume there was a lot of cloudy days. Also, it was down right cold a lot of the month. I only put ice in the cooler a few times. With the forecast predicting warmer, drier weather in the next 10 day we will soon see if there will be any cicadas to be found this 2010. The last few days I have noticed some black stones on the water. They seem to be out for a short time each March. No more than a week or two. They are around a size 10-12. They can be a nice break for the eyeballs after staring at a size 22 midge all day. They can also jump start your heart as the strikes have a tendency to be aggressive. The action isn't fast and furious so I prefer to add a midge dropper while fishing these stones. While the occasional blue wing will show up in the afternoon, Midges are definitely the main diet right now. 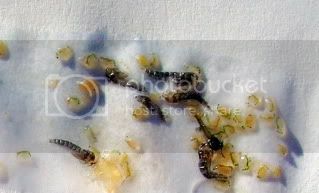 Midges can come off in a variety of colors. 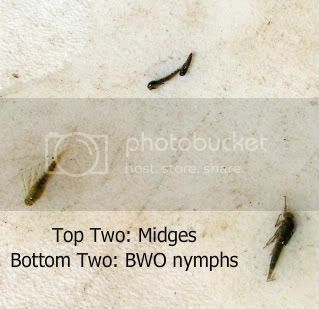 The midges in this picture are a gray and black (the orange is called daphnia). You may want to take some samples if you really want to match the hatch. In march one of the most common colors is a dark reddish wine color. I also like to fish rainbow and purple UV colored midges. The larva are generally very skinny. Tying midges very skinny can be key to catching the picky fish. The adults and emergers tend to be black. Some times their belly will have a little color to it such as grey or cream. Most black flies such a Trailing Shuck emerger, Brook Sprout, or Griffiths Gnat work just fine. Here is a question I get a lot!!! My standard answer is that is depends on how you want to fish. If you want little dry flies the answer has to be, BWO's in april. If you want to fish big dries? Mid-May to mid-June and hope that there is a good Cicada hatch. Otherwise, July and August tend to be the best big dry months. If you just want to catch fish, April, May, and June the fish seem to be the most active. If you want to avoid the crowds, mid-October to mid-April on a Tuesday or Wednesday. The best time to catch big fish has to be late fall and winter. They start to show themselves during the day time. With that brief summary, I think that the best time to fish is before a weather front comes through. It doesn't seem to matter what time of year it is, the fish are very active before the front. As soon as the front comes through they can shut off immediately. If possible, no matter the time of year, try to plan your fishing adventures around the weather. When is the best time to fish? Let the weather show you. Cicadas have been out in force the last few days and the fish are starting to eat them well. They are the smaller cicadas around a size 8. They have less orange in them than the picture below. This picture of a cicada goes a long way in describing this trout treat. These smaller cicadas (platypedia) live anywhere from 3-7 years in the ground feeding on the roots of trees before they emerge. The are considerably smaller than there eastern counterparts whom make many headlines in the news. They tend to be a size 8 or 10, possibly even smaller with less orange on the wings. We also have a 13 year cicada (magnifica) or sometimes referred to as a mondo cicada. In years where they emerge it usually occurs in late June or early July. The magnifica cicada is much larger than the platypedia and is about a size 4 or 6. When a cicada emerges from the ground it will climb on to a branch, warm up, and the males will use timbals located on there back to perform a mating call. The smaller platypedia makes a clicking sound, while the magnifica sounds more like a power line buzz. This hatch make the Green famous, so if you fish it, you won't be alone. It's worth it though. I have been told many times this past couple of months that it was the best dry fly day of someone's life.